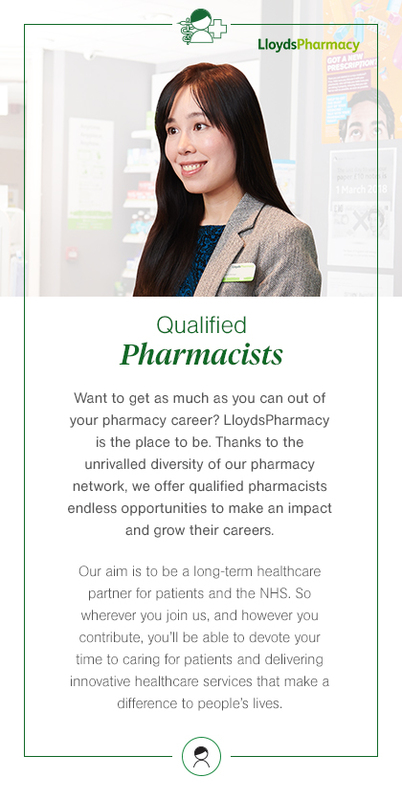 There are so many different directions you could go in at LloydsPharmacy. Not only do we have around 1,700 community pharmacies across the UK. We also provide outpatient dispensing services in over 50 hospitals, and other pharmacy services to care homes, mental health facilities and prisons. It’s not just about dispensing medicines either. Our holistic approach includes offering private consultations and medicine use reviews, and delivering free screening services as part of the national diabetes prevention programme, among many other things. This makes us the first port of call for customers who can’t get in to see their GP. We’re also revolutionising pharmacy in the UK in a number of different ways. For example, our innovative new healthcare centres allow patients to receive nurse-led infusions and injection treatments closer to home. We have also introduced prescription automated assembly solutions (PAS), which free up pharmacists to spend more one-to-one time with patients by taking repeat dispensing out of community pharmacies. Your growth and development is important to us. That’s why we will provide you with everything you need to become an expert in your chosen field. As well as the freedom to make a real impact, you will have opportunities to develop and regular discussions and reviews. Then there’s myLearn+, our industry leading e-learning platform. It brings healthcare professionals together and offers easy access to over 1,000 articles written by industry experts, as well as a wealth of digital and e-learning modules. There’s a lot to discover at LloydsPharmacy. And, now we’re part of McKesson, it means you’ll have more opportunities to develop than ever before, in multiple areas. As well as opportunities to move into different settings, such as mental health, hospitals or clinical homecare, you will also have the possibility to become a Pre-Registration Tutor or Regional Trainer. You could even enhance your clinical skills in a range of services, such as diabetes or oncology. Thanks to our management and leadership programmes, you will receive the support to improve your store’s performance and patients’ lives. You’ll also be able to progress from a Pharmacy Manager to an Area Manager or Professional Support Manger among other roles. At the heart of our business sits our Support Centre. With roles in HR, Marketing, Retail Operations and more, our 1,000-strong colleagues at Coventry base keep the McKesson brands ticking. So, if you want to develop your career in a different direction, there are a lot of options for you to explore, such as Professional Standards Pharmacist, HR Business Partner or Central Operations Manager. Thinking about relocating? We may able to offer you relocation assistance, depending on where you’re going to be based.